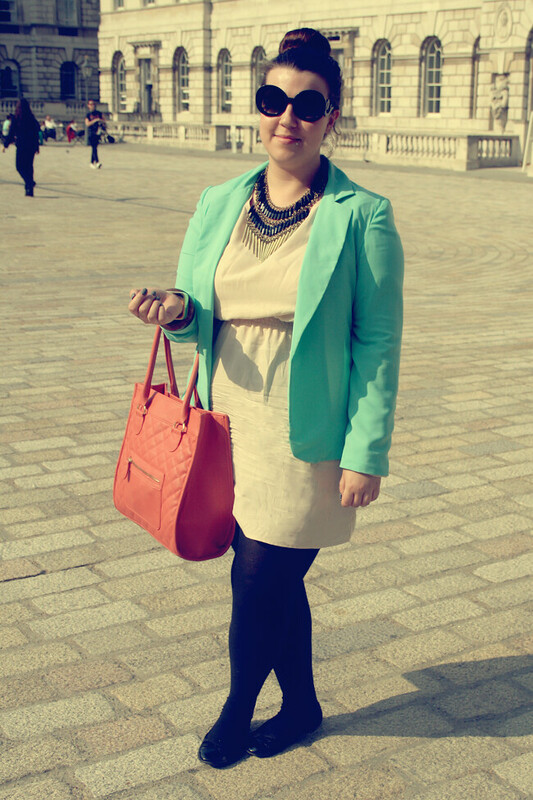 I wore this outfit when I went to London last week for the Next A/W press day (more on that tomorrow!) I bought this dress especially for it as with the colour and material I thought it would be really cool on the hottest day of the year (ignore the tights and blazer – figure issues) What I didn’t think about it how creased it would get and how said creases made it a lot shorter (que dress riding up to my bum whilst walking across kings cross and not realising until on the train) but after a wash and iron it's back to normal. So i'm going to be typically British and say HOW AMAZING IS THIS WEATHER?! I'm one for routines and don't like to deviate from it but everything went out the window this weekend as all I wanted to do was sit outside and enjoy the sun! I've never faked tanned in my life so if the chance comes up to get a natural one I go all out. It also means I don’t have to wear foundation as the sun does a great job of giving me an even skin tone so that takes a few mins off my make up routine in the morning. I even washed my hair purposely this morning just so I could sit outside and let it dry naturally. Please don't leave us sun! This is my last full week off before I start my new job (yay) so I’m hoping to get loads of blog post written up and scheduled for the days when I’m working (I really don't want to break my blogging every day rule) and hopefully I can keep on top of it all! I was going to go home this weekend for the bank holiday but there are lots of reasons for not going so if anyone knows of any events going on in Leeds please let me know! I'm going down to London again on Thursday for the Debenhams press day which i'm really looking forward to because I get to spend the day with Gemma which is just as amazing! Today i'm off in to town to meet the beautiful Summer and help her with some bloggy things! She's FINALLY rejoined Youtube again so everyone go and say hello! Hope you all have a wonderful week whatever you have planned! Thanks Lily for taking the pics. Gorgeous! Love the blazer and necklace! So lovely, looks great on you! Love the dress and the blazer! The colour of the blazer is so nice. You look lovely! I absolutely love this outfit ..the colors are beautiful! Fantastic outfit! I love the color blocking! I love the bag! Can you show us a similar one we can buy? you look amazing, the dogtooth fingernails are perfect with the pastel blazer. I love your nails !